The month of May has been all about chasing tarpon and my abusive, love-hate relationship with these fish that just don't want to cooperate. So today was kind of a relief when Naples anglers Bob Neubert and Ron Reilly decided that their third trip with me this week would be all about chasing snook and reds instead of the tight lipped silver kings. The snook have been absolutely everywhere and Ron nailed a beautiful 30 incher last Sunday. Today we stayed in the south part of Matlacha Pass and worked the creeks that were flooding on the incoming tide. The narrower the creeks, the more fish we spotted. The two reds that came to the boat were 28 and 24 inches, both caught by Ron on white Super Spook Jrs. The bigger redfish, pictured at the top gave one of the most violent strikes I'd ever witnessed on a topwater, looking more like a Key West barracuda slashing in just under the suface than a bottom feeding crab eater. These were the first two redfish I've had on the boat in over three weeks. Granted, I haven't be chasing them much since the tarpon arrived but I just haven't been seeing them on the flats either. Today they didn't exactly come out of the woodwork but it was really good to have them back and behaving like the aggressive reds that we know and love here around Pine Island. I've been tying all of my tarpon flies for the past ten years on Owner Cutting Point hooks, specifically the Model 5311-121 in size 2/0. There are a couple of reasons that these have been my only choice for all this time. First of all, they've got the sharpest point I've ever seen. Their triple edge functions almost like a knife blade allowing it to slice into the bone of a tarpon's mouth. They require a lot less pressure on the strike to do this and still hold. These hooks have a small but very effective barb that keeps them in place but still allows them to be quickly and easily removed with little damage to the fish. Finally, their forged steel allows them to rust quickly if they're left behind in a fish's mouth. This is a very common occurrence in tarpon fishing and is the reason why I never use stainless hooks for this species. Owners aren't cheap but you don't want to cut costs when it comes to the possible fish of a lifetime. The tarpon were MIA for me once again today but the snook are as aggressive as I've ever seen them. They're blasting topwaters right along the mangroves and some that we're spotting are really impressive slot sized fish like this one caught by Naples angler Ron Reilly. My charters have managed to land big snook on artificials all month which makes the lack of redfish and frustrating tarpon of the past week a lot more tolerable. The winds finally died down yesterday but the baby tarpon have been slow to start rolling again in Matlacha Pass. Charlotte Harbor is still just a bit murky and that makes the bigger cruising fish a little tough to spot, too. That will all change in the next 48 hours and the tarpon fishing will come roaring back to life for anyone looking to sight cast to these guys with a fly rod. The snook fishing on the other hand has been awesome all week. I was amazed by the sheer numbers of big fish we spotted yesterday. 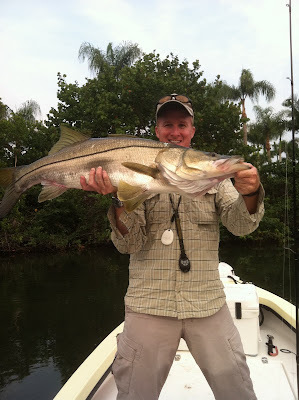 I was on a charter with local angler Steve Pivacheck and the photo above is a close up of the first snook that he landed on a green and white Deceiver fly. These fish were all over the mangrove shorelines from Burnt Store through Buzzard's Bay. Every bush we cast two had a handful of 20 inchers underneath it and every 50 yards or so we'd spot a big slot-sized fish sunning itself over a bright sand spot. Whether or not the state decides to open their season up again this fall, our snook population here in SW Florida is exceptionally healthy. Right now I'm sitting on the fence with my opinion on this issue. I'm content to catch and release them but I also think reopening the season will send a positive message to the potential anglers who would like to come here and fish for them later this year. For once, I'll actually be ok with either decision that the state of Florida makes on an issue that directly affects me. That's a weird feeling. Every few years a trendy new fly emerges on the flats fishing scene that quickly gains a cult following among certain groups of anglers, especially the permit crowd. Unfortunately, most of these patterns are nothing more than a slight modification of Del Brown's classic Merkin crab fly. Very few of these "new" flies bring anything new to the table other than a lot of well managed PR (I'm looking at you Dorsey's Kwan,) or are any more effective than Del's original creation. The Avalon Crab is different. This is the first fly I've seen in a long time that is a real departure from the Merkin with some innovative features that set it apart from almost everything else. The pattern was created for the untouched permit and bonefish flats of southern Cuba and even though it looks more like a shrimp, it will clearly fool any crab eater. I've just started fishing with these flies here in Southwest Florida and so far it's been a redfish and sea trout killer. (Update: The pompano love it, too.) I have no doubt our baby tarpon will also clobber it thanks to the rattling beads tied over its shank. The noise they make sound just like the clicking of grass shrimp in our dark waters. The Avalon Crab really is a cool new pattern that everyone who chases fish on the flats should have in their box. Capt. Joe Harley is not a superstitious guy. My buddy Paul Murray sent me this shot of a big east coast snook that he caught last night on a DOA Glow Shrimp. There are some real brutes over there and this 19 pounder is one of the baddest I've seen in a long time. Awesome catch. Angler Doug Rooney, who spilts his time between Cape Coral and Idaho, came out with me this morning in hopes of landing a tarpon on the fly but had to settle for a mixed bag of other species that kept hitting him instead. ﻿The highlight was this 12 inch pompano that crunched a 1/0 Tarpon Bunny pattern. These excellent tasting fish are are rare catch on any fly, especially a fast moving streamer. Just another example of the great opportunities in Matlacha Pass. They're here. ﻿Early mornings in Matlacha Pass are perfect for targeting rolling tarpon right now. These aren't the triple digit monsters of Charlotte Harbor but they're perfect fly rod sized fish like the 20 pounder in the photo above. May is one of the best months of the year to chase tarpon in Southwest Florida and June is even better. The only drawback to tarpon season is the heat but this is an early morning game. Most of the best action happens within an hour of sunrise giving anglers the perfect excuse to duck in for an early lunch each day. Temple Fork Outfitters (TFO) is one of the most interesting manufacturers in the fly fishing business these days. This Texas based company was one of the first to introduce a line of truly affordable rods that were both great to cast and sturdy enough to handle the harsh saltwater environment. Their smartest move however was teaming up with fly fishing legend Lefty Kreh, and then giving him a free hand to design many of their products. For those of you who aren’t familiar with the name, Bernard Victor “Lefty” Kreh is the angling equivalent of Michael Jordan, Ernest Hemmingway, Thomas Edison, and John Wayne all rolled into one. It is impossible to underestimate his importance to the sport over his last 83 years. He has written books, designed gear, and been the best possible ambassador in the entire history of fly fishing. And thanks to Lefty joining forces with TFO, the world finally had a selection of $99 fly rods that many anglers wouldn’t hesitate to take on a saltwater fishing trip. These great rods, called Lefty’s Signature Series, were really something else. I wound up handling a lot of them over the last few years, especially when I was guiding down in the Caribbean. Many of my anglers picked up an inexpensive TFO as a travel or backup rod because they didn’t mind submitting a $99 piece of gear to the horrors of checked luggage. Having anything crushed by an airline baggage handler is painful, but $99 won’t break the bank. And TFO still managed to give their rods a lifetime warranty just like their more expensive competitors at Sage and Orvis. I always make a point of casting a new rod when I see one on my boat and the various TFOs never failed to impress me. They were way better than you’d expect for the price and I always told that to the anglers who brought them. However, with TFO, I could always tell that I was casting a good rod but not a great one, due to their weight. They just weren’t in the same category as the Sage Xi series that were my personal choice. I would have gladly owned a Temple Fork rod, but I just wouldn’t have used it very much. All that changed last year when TFO unveiled their latest fly rods designed by the team of Lefty and Flip Pallot, another famous angling personality best known for his classic “Walker’s Cay Chronicles” TV show. This new BVK series of rods, designed for both fresh and saltwater is a real game changer. Priced at just $249 for the 7 through 10-weights, these 4 piece, 9 footers cast as well or better than almost anything their competition makes at twice, or in some cases triple, the price. A couple months ago I picked one up for the first time and easily cast an entire 100 foot fly line. This was really amazing since it was such a light rod, a 3.1 ounce 7-weight, and I don't consider myself a long distance caster. If I didn't know this particular rod's price to begin with, I would have guessed that TFO was charging at least $500 for it. It was an amazing piece of gear and the 7-weight BVK is the perfect outfit for working the local grass flats for sea trout around Pine Island. Where TFO’s heavier rods in the BVK series are concerned, they are the perfect tools for chasing redfish, snook, and tarpon throughout Southwest Florida, and so is their price. Finally, I'm not writing any of this just to shill for TFO. They are not giving me a deal on any of their gear. I've actually been on Sage's guide program for the last fifteen years and every fly rod I currently own has their name written on it, but that's about to change. One of those little BVK 7-weights will be my new trout and baby tarpon rod very soon. At $249 plus a lifetime warranty, that deal just can’t be beat. The anglers around Pine Island and Matlacha have been slow to embrace fly fishing but Lefty Kreh and Temple Fork can change that. If you're in the area you can pick up a new BVK or one of several different TFO rods and reels at Florida Paddlesports on Pine Island Road. If you’ve given the slightest thought to fly fishing, stop by this area’s newest fly shop and take a look at what a little money can buy you. Temple Fork Outfitters, and their great BVK rods, won’t disappoint you.